Want to know what’s in book three? I’m getting close to finishing the third book in the Sam Osborne detective series, and while there’s still a long process before the book goes to press, it occurs to me that mom and I have given very few hints about the plot of this book. The title, Fate of the Violet Eyes, does not fall off the tongue as smoothly as Twist of Fate or Wretched Fate, but I think the story is our best and the eyes play a major role partly because they affect the lives of several main characters. One of those characters, Maggie, needed special consideration and crafting because we knew we wanted to give her a precious gift: the love of Sam. It’s a gift because, as we’ve brought Sam more and more to life with each new book, we’ve both fallen in love with him. His gentle, but persistent ways, strong personality and inquisitive mind are easy to fall for, and Maggie needed to be worthy of him. In Fate of the Violet Eyes, readers will learn even more about Sam and meet Maggie for the first time. In our other books, the characters who hire Sam and work with him fall in love with each other. In this book, Maggie is the person who hires him—a mother mourning her child Jenna, who was kidnapped. Even though the police and the FBI have both conducted investigations, her child is still missing so she hires someone who is not constrained by procedures or resources—private investigator Sam Osborne. My mom has done a terrific job creating both the villain in this book and the victim (the snatched child). She takes us into the mind of a man who has gone from a religious background to a killer. She shares with us her thoughts on how a small child could survive such a heinous crime as being snatched from her own mother’s arms and delivered into a killer’s grips without showing fear or weakness. The mystery in this plot is sprinkled throughout the story revealing clues and false clues in layers as you read. Mom designed it that way and we both have worked hard to confuse and surprise you. Meanwhile, Maggie and Sam begin to work together, and as they do, you’ll see them gravitate towards one another. As readers of our first two books know, Sam’s own child was kidnapped many years ago and that plays a role in how Sam reacts. This book also travels outside the bounds of Lancaster, which is where our first two books took place. Maggie and Sam hit the road to investigate and love happens along the way. I can’t tell you much more, but I’ll promise this: If you liked Twist of Fate and Wretched Fate, you will love Fate of the Violet Eyes. Keep tuned to this site to learn the book’s progress. If anyone had told me five years ago that I would be a television star, I would have called them nuts. Never mind the miracle of finishing three books, getting published twice, getting offered a contract on a third book. And yes, it’s a small miracle that being an author has brought me out of my shell long enough to speak in front of audiences. 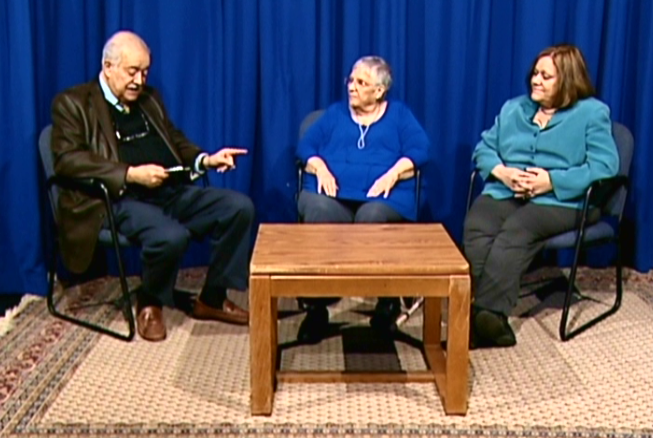 But last week, mom and I launched our official road to celebrity-hood by taping the Rich Massabny show—Conversations with Rich (airing times on this page). I just KNEW at that exact moment that we’d made it—fame at last. Okay, maybe not fame and there really wasn’t a lot of guys and gals. Just a friendly fellow with a pony tail, several youngsters who looked like they’d just left diapers behind last week, and a nervous young man who kept clearing his throat. But it was our first filming crew. The same crew with which we’d just shared the delicious spread produced for the television crew. Okay, maybe it wasn’t a spread or one of those feasts that unions require for movie crews. It was leftovers from the cooking show that went on just before we did, but we could tell it was delicious by the many ums and ooohs. We couldn’t eat because we were too nervous. Okay, really it was because mom and I too often tend to wear what we attempt to put in our mouths, and we didn’t want to spoil our new blouses. Then there was the excitement leading up to the taping. You know … that room with a star and the makeup girl fussing to make you look just right. Okay, that’s a downright lie. I sat in a waiting room and made conversation with my fellow author―mom. At one point, I ducked into the ladies room and put on lipstick―which I hate in the hopes that it would make me less pale. It didn’t work. Nevertheless, there we were, “on stage” for the first time, sharing our hopes and dreams with the whole wide world. All right, maybe our hopes are really that just a few people who might happen to be bored with Jimmy Fallon will flip through the channels at the exact moment we’re on. But back to my original thought. I could not have imagined five years ago that instead of sitting watching the tube next week, I’ll be watching myself.